Nine professional big rig drivers from West Virginia are competing in the National Truck Driving Championships that took place Aug. 11-15 in St. Louis MO. They joined several hundred other tractor trailer drivers in the event, which was held at America’s Center Convention Complex & Edward Jones Dome Center. The WV big rig drivers earned their way to the national safety competition for truckers based upon their performance in the WV state competition in June. 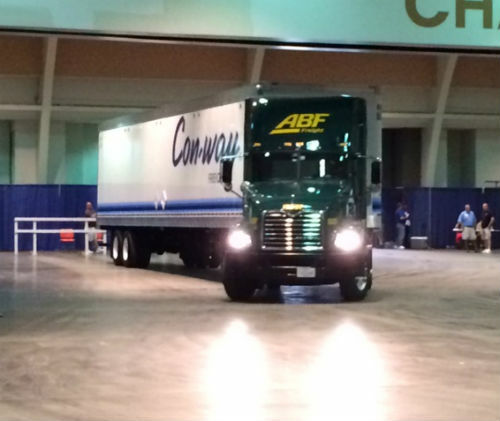 The event had 420 highly skilled and safe truck drivers from all 50 states. The four-day event testing their safe driving skills, as well as their general knowledge of safety and equipment. Our Virginia trucking injury legal team applauds these highly safe and professional West Virginia truck drivers. It is wonderful to see so many truck drivers from West Virginia and around the country who place such a high priority on truck safety. We have seen over the years many truck crashes and accidents where safety was not paramount in the drivers’ or companies’ minds. We read about a case in Virginia where a minivan passenger was severely injured because a boom of a crane being carried on a trailer hit an overpass. This broke loose a 25-pound hunk of concrete that smashed through the woman’s windshield. The heights of overpasses are not a secret kept by the federal government. Commercial truck drivers must map out their maps that will prevent low-clearance events from occurring. Still, low-clearance truck accidents happen often, which lead to serious injury and death. We urge all truckers to place the kind of emphasis on safety that these super safe drivers in West Virginia do.